Part 5: How Much Should You Drink Before a Marathon? In Part 4 of this series, Active Expert Matt Fitzgerald explored how fat loading and carbo-loading affect performance. In this article, Matt debunks what's become widely accepted pre-race hydration advice. If you've been a runner for longer than a week, you've probably read the following statement at least once, if not dozens of times: "As little as two percent dehydration will have a negative effect on you performance." But if this is true, how can it also be true that, as a recent study revealed, the typical winner of a major marathon is nearly nine percent dehydrated at the finish line—and still ran as fast toward the end as he did in the first mile? The apparent contradiction between these two facts arises from how researchers tested the two-percent dehydration claim. In these studies, dehydration is induced through passive heat exposure prior to a bout of exercise. When a person begins an exercise test two-percent dehydrated or more, a negative effect on performance is seen compared to when the same person starts the same test fully hydrated. Things are different, however, when a person begins an exercise test fully hydrated and gradually becomes two-percent dehydrated or more as a result of drinking less fluid than is lost through perspiration. In these cases, dehydration has no effect on performance as long as the person drinks enough to satisfy his thirst. In short, the often-cited "two-percent dehydration" claim is misleading. 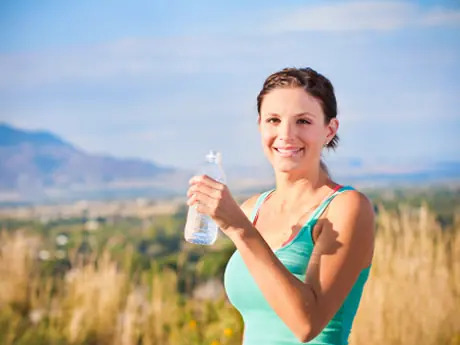 But it does make the valuable point that it is important not to be dehydrated when you begin exercise—especially when that exercise is a marathon. One of the important objectives of pre-race nutrition, therefore, is ensuring that this doesn't happen. Few runners start marathons and half marathons in a state of two-percent dehydration, or even one percent. In fact, many runners are overzealous in their pre-race hydrations habits. They attempt to "load up" on fluid, drinking much more than they normally do in the hope that attaining a state of maximal hydration before the race start will minimize the effects of dehydration on their performance in the final miles of the race. This is not a practice that runners have come up with on their own; rather, it is one that they have been taught by coaches and sports nutritionists, some of whom even invoke the famous "pee rule." The running blogger Dave Munger has observed, "One piece of advice I've heard given to marathoners is that you should pre-hydrate as much as possible before a race: According to this line of reasoning, the more you pee, the better you'll do. And make sure you've had enough that your urine stream is completely clear."